I forgot that today was a Friday the 13th altogether! Then this morning, I saw this meme on Facebook, and thought it was funny - some of the answers really cracked me up! What if Gloria Gaynor didn't love the nightlife? What if she didn't like to boogie? What if Santa Claus never came to town? What if the Red Red Robin never came bob-bob-bobbin' along? What if James Taylor was never your friend? Feel free to play along if you like - I know I'm gonna be thinking about more of these silly things all day! What if Tony Bennett didn't leave his heart in San Francisco? What if Frank Sinatra really didn't do it his way? What if Lola didn't do the cha cha at the Copacabana? So silly and funny. Thanks for the laugh! Okay... so what if you did not save the last dance for me? Or, what if you let me be lonely tonight? Or, what if you couldn't find another you? 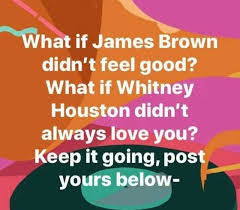 What if Gloria Gaynor did NOT survive. What if the shark didn't use his pearly whites? What if Frosty wasn't a very jolly soul? What if the Beatles didn't want to hold my hand? Wow, that's all I got. This is hard! Yours are better than the originals! What if The Beatles didn't all live in a yellow submarine? What if Bill Joel wasn't The Piano Man?